Rebecca came into town last week and it's a good thing she did because I miss her and this living across the country business isn't funny anymore. Her flight landed at 11:55 PM. WHEN IT IS ILLEGAL TO BE OUTSIDE. She asked me to pick her up at the airport. The moment she asked I assumed that her flight was going to get in at the most inconvenient time possible. Because Rebecca would never land in Salt Lake City, demand that I pick her up from the airport, and do so at a convenient time. I actually think she called the airline and somehow convinced them to schedule her flight for "whatever time will put out Eli most." 11:55 PM. ON A SCHOOL NIGHT. I texted her and informed her that I would not leave my home to pick her up until she called me and informed me that the plane landed. Because I was absolutely convinced that if I arrived at the airport at the scheduled time, I would discover that the plane was delayed 27 days, or Rebecca didn't make her flight, or the flight never existed in the first place, or Rebecca never existed in the first place, etc. GOD HIMSELF doesn't even know what Rebecca is up to. She is the one loophole to his whole "all-knowing" claim. Nothing that I have ever done with or for or near Rebecca has happened neatly or according to any plan that has ever made sense. I got into my car and drove to the airport where I retrieved Rebecca, who talked at me non-stop, 3,000 words per minute, about anything and everything that she has ever thought or thought about thinking in her entire three decades of being a genius who somehow has the brain capacity of 15 human brains. Rebecca: Everybody lies. You just have to accept that. Eli: Right. Wait. What are we talking about? Rebecca: I mean, everybody tells lies sometimes. Like how I lied to you about the lamp! Eli: Ok. Wait . . . what? Rebecca: I lied to you about that lamp. Remember? Eli: No. As usual, I have no idea what you're talking about. Rebecca: Remember when I bought you that lamp and you said you didn't like it and demanded that I trek back out into the rain--me, a defenseless wholesome innocent half-French woman--to get you a different lamp so you wouldn't kick me out of the apartment? Eli: First of all, once again, that is not what happened. You bought a lamp and then showed me a picture of another lamp and asked which one I liked better and I told you I liked the one in the picture better. Then you informed me this was a gift, called me ungrateful, and before I could stop you, you stormed out of the apartment, into the pleasantly-weathered day, walked across the street to the store, and exchanged the lamps. Eli: Anyway, what did you lie about? Rebecca: Well, you asked me if I exchanged the lamps and I said yes but I had not exchanged the lamps because I just kept the first one for myself because I realized after I bought it for you that I wanted it for myself and the whole reason I showed you the picture of the other lamp was to manipulate you into choosing it so I could keep the first lamp, pretend I exchanged it for you, and look like the hero. The next morning Rebecca left my home and I had that uneasy feeling one gets when it's "quiet. A little too quiet." Because nothing catastrophic happened during Rebecca's stay. And that is very unlike her. For example, my kitchen didn't burn down. Also, all of the windows and doors were not left open overnight and I woke up with both of my kidneys. Then, after she was safely at her parents' house, an hour or so away, I realized that she stole my phone charger. I need you to understand that this was not a simple mistake. This was a complicated and inconvenient mistake. Sure. Someone can easily grab another person's phone charger and take it with them. This can be a very simple mistake in most circumstances. All iPhone chargers look exactly the same. But y'all. My phone charger was hidden away in a room Rebecca had no reason to enter, plugged into an outlet that was hard to reach, and her charger was sitting in plain site the entire time. In fact, I watched her pick up and pack away her own charger five minutes before she left for her parents' house. And yet, somehow, in those five minutes, she forgot that she had done this. So she wandered into a room she had no business being in, maneuvered her half-French body in very uncomfortable and unnatural ways to reach the outlet, unplugged my charger, and packed it away IN THE SAME FREAKING BAG SHE HAD ALREADY PLACED HERS. Eli: YOU STOLE MY FREAKING CHARGER! Rebecca: No. I only have mine. Eli: DID YOU CHECK YOUR FREAKING BAG? Eli: CHECK YOUR FREAKING BAG! Rebecca: Oh . . . I have two. Rebecca: I'm a complication in your life. I borrowed chargers for a number of days. 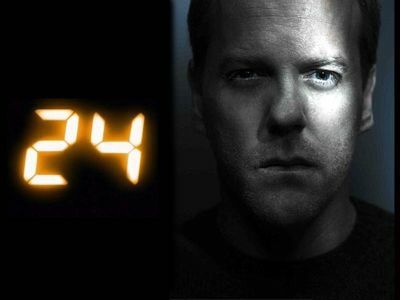 I felt like Jack Bauer on 24. Like a clock was dramatically ticking and my time was constantly running out. Then on Sunday Rebecca made it back for a quick visit to Salt Lake City, wherein I demanded that she return my things. She did so, reluctantly. And then after visiting for a while, drove back to her parents' house. It was too late when I realized she had returned the wrong charger. Do your chargers interchange, as in, both chargers will charge both phones? If so, then I don't get what the big deal is. If not, then What The Eff, Rebecca, you Complication in Eli's Life, You? It's not like there's not an Apple Store or iAnything Store or ANY reasonably-priced and conveniently-located iPhone chargers around whatever part of SLC Eli lives in, or anything. You HAVE to be more responsible with his things, Rebecca! How COULD you? ... and you call yourself his Bestie. HA! Great post, Eli! See how much more fun it is when you're not manipulating and shaming people? My favorite part about reading posts like this is wondering what really happened, and then thinking about you sitting in front of your computer brainstorming what would have made this story more exciting. I'm truly looking forward to the next few weeks of light hearted fiction until that time of the month comes around for you. Happy Thanksgiving, pal! "See how much more fun it is when you're not manipulating and shaming people?" ...Well that wasn't passive aggressive at all. I was going to reply and tell you that I've had about enough of you, but in the spirit of Thanksgiving I won't. Instead I'm going to tell you that I'm thankful for you, because you show me how I'll be if I ever let myself become cynical, so thank you for inspiring me to keep believing in people, and for helping me realize that I don't have to like everyone, but I can still learn an important lesson from them! :) happy thanksgiving! I have an iPhone and chargers, hubby has something...else..frankly, if it's not an iPhone I don't know what the hell it is and eye it suspiciously from across the room. That said, this does not preclude one or the both of us attempting to plug our phones into the other's charger (that sounds vaguely innuendo-y, as does the word 'innuendo'). It doesn't take long to swear, stomp, and curse the other's charger to the point of vowing never to touch it, let alone steal it. I have no idea where I was going with this, because 1. old and 1A. I slept about 45 minutes total last night. Stupid insomnia...which I've never had before, and never want again thankyouverymuch. Oh Rebecca, how we've missed you. Love this story and love this blog. You guys are awesome. Have to say there's a truly easy solution to charger conundrums--buy a bunch of them. That way when you leave one at the office/at home/in the car/in Rebecca's bag (we're not fooled, Eli--you PLANTED it there 'cause that's how lawyers do stuff, amirite?) you have plenty of others. If you had kids, you'd already have done this as they would have lost many many chargers for you ages ago, so part of your problem is slacking in the grandkid area (Bob and Cathie, amirite?). C'mon, with your big city lawyer-salary-brainskills, *this* shouldn't even be an issue. And by this, I mean both the charger and the grandkids. Sheesh. As soon as I read PLANTED, it all made sense. HE DID PLANT IT! Did he not start out by telling us how Rebecca living across the continent isn't funny any more? He was using the old "but wait you have to come back, you have my charger in your bag" ploy and it worked! She came back. She should have mailed it so he wouldn't thing those kind of ploys would work. Maybe you should adopt Rebecca as your child. Everyone needs a Rebecca in their lives to understand how boring their life is without her. I mean, Eli was Daniel's Rebecca, and pretty much everyone else he has come in contact with. She isn't God's loophole. She's God's "now you know how it feels." Cool. I think I can fix that. Let me give it a try. Sue Ellen, you and I are on the same page. I was just noticing that myself the last couple of blogs. Ok. I fixed this just for you, Sue Ellen. We'll let Matt yell at me later for choosing ugly link colors. Lee, I was on Sue Ellen's page with you too. So glad Eli fixed it for her so we could all see the same thing! Except now I have to re-read those posts all over again so it shows that I've read them . . .
hahahaha. Favorite funny post in a while! I miss Rebecca posts. They're always my favorite. Plus, she's part french, so she's even more awesome. I mean, she's practically Canadian. And who doesn't love us Canucks AMIRIGHT!!?!? Lee - we love you in spite of the fact that you're Canadian. . . .